Home My sewing worldItalianSewingRevolution	Fashion Revolution – I made my clothes! This is the Fashion Revolution‘s week! For three years, over this week, lots of people from all over the world have posted a selfie on social networks with their clothes turned inside out to show the labels and ask the brand “Who made my clothes?”. The aim is to gain a “cleaner, safer, fairer, more transparent and more accountable fashion and textiles industry” and to know the story behind the people who make our garments. Nowadays we pay only very few euros a t-shirt because fabrics and materials are very low-quality and, above all, because people at the other end of the world are underpaid and exploited to make the clothes we wear. On April 24th 2013, the Rana Plaza building collapsed in Bangladesh. 1133 garment workers died and over 2500 were injured. They all sewed garments, in hard working conditions and with starvation wages, for some Western brands that outsourced the production of their collections abroad because manpower costs much less (in Bangladesh garment workers earn £ 44 per month, just ¼ of a living wage *Fashion Revolution 2015 source). 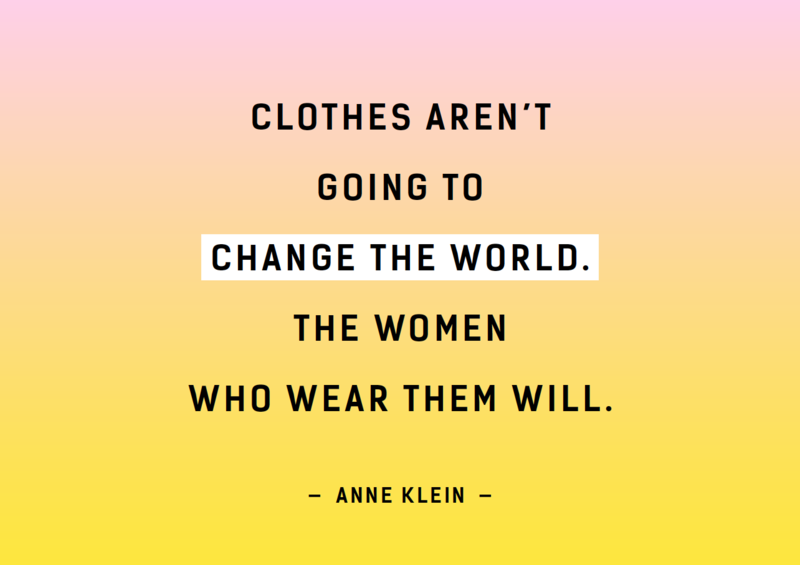 The Fashion Revolution was born with just this aim: to have our eyes opened on the real cost and the after-effect of the fast fashion system, whose main characteristics are to design and manufacture garments in the quickest and least expensive way. Before coming across Fashion Revolution and getting information about it, I got fed up with buying low-quality garments at a very low price, garments that hardly last a season. I have never been a fashion-victim, anyway I made a lot of mistakes in buying clothes and accessories captivated by the super-special offer, without having clear ideas on what I really needed at that time. Result: I’d always had a wardrobe filled with stuff I mostly didn’t wear and only a few clothes that I adored and made me feel at ease. Moreover I often didn’t know how to put outfits together and I sometimes found myself staring at the wardrobe with anxiety and discouragement on the lookout for something that could roughly have matched with the dress I’d have liked to wear. After a while I got fed up and I changed my shopping habits, getting more selective. I got informed little by little, reading the labels of the garments, paying attention to where and in what material/fiber they were made, looking for quality garments. And finding something that I really liked had become very hard lately so I bought almost nothing for some seasons. My real turning point was starting to sew my own garments and personalise all of my dresses. If I need a dress now, I sew it on my own and my wardrobe gets a radical change! Sewing has been essential for me to improve my style and get focused on what I really like and what suits me better. I’ve learned to better know my body, my strengths (and weaknesses) and to set them off (or hide them). And it lets me give a new life to some garments I didn’t wear anymore, changing or restyling them. To me, DIY means fun and consciousness. Fun because I really enjoy making things. I love every single step of making a garment: choosing the fabric and the pattern, think about the final result, cut the fabric and then sewing it. And at the end having a unique dress. Consciousness because sewing my own dresses has helped me to understand how much work there’s behind the making of a garment, it teaches me to shop in a more careful and ethical way. I’m not saying that I won’t buy a garment in a shop anymore (even if I haven’t felt the need to do it over the last two years). If I should find a dress I really like, I wouldn’t have problems buying it. The point is that I’ve become a lot more selective over the last years. This’s taken me to choose carefully and love more every single garment I have in my wardrobe or I sew/buy. 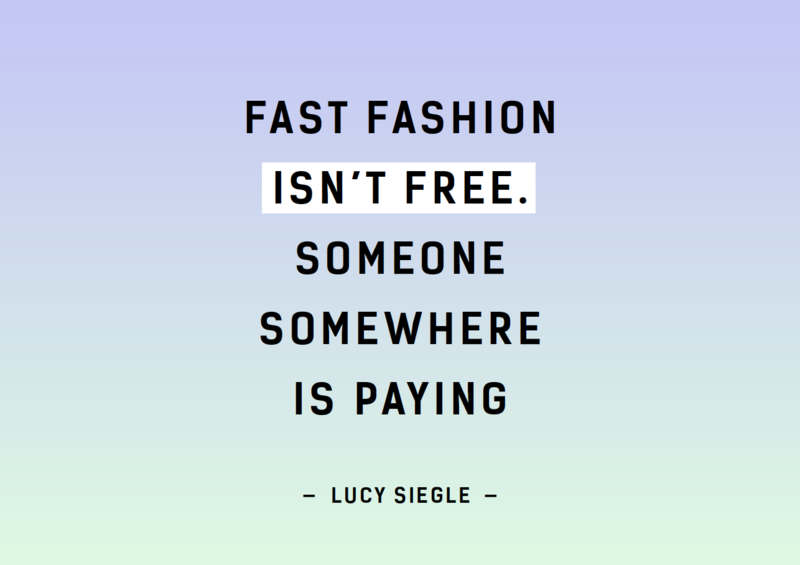 I think that the solution to fast fashion could just be this one: starting to love our garments more, both if you sew and buy them. Here are some suggestions to try to do it (you can find many other suggestions on Fashion Revolution’s website)… changing habits is possible and it’s to our advantage, even economically. Let’s stop for a bit and build our own style. It’s fun and money/time-saving. Only few interchangeable clothes (that you can combine in multiple outfits) are enough to get a perfect wardrobe and to feel at ease in every occasion. I suggest you read “The Curated Wardrobe”, if you need a guide to experiment and create your own style…it’s a good book. 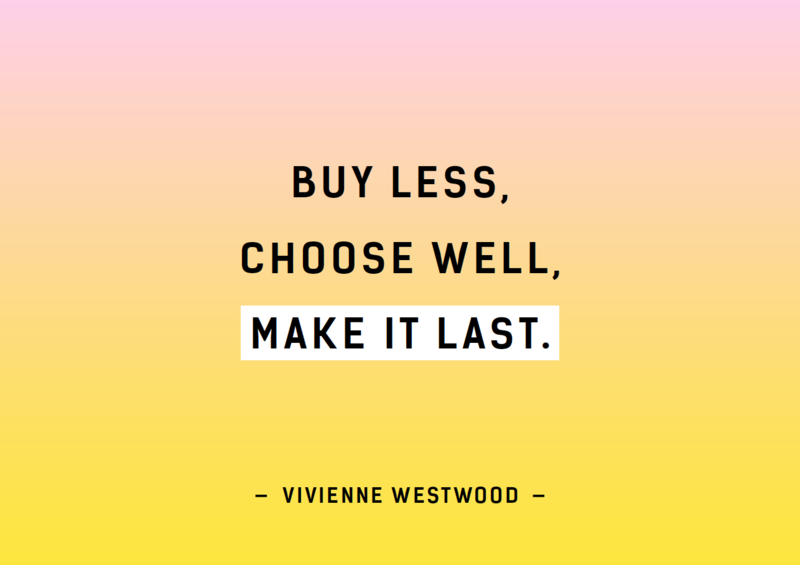 Buy less, choose well, make it last (Vivienne Westwood). Journalist Lucy Siegle came up with this good rule: when you are about to buy a garment or an accessory, think if you’ll wear it at least 30 times. If the answer is yes, buy it, if not give up. The same for fabric obviously… think of the garment you are going to sew and ask if you’ll wear it at least 30 times. It’s a precious time/money saving, because it lets you choose only those garments that you will really wear and love! Try different and fun ways out to go shopping: second hand, vintage, swap and slow fashion (for instance young designers or artisans). Fall back in love with the things you already own in your wardrobe and try new outfits out or rebuilt your garments. You can find a lot of DIY tutorials online, some of them very simple and fast, to customise and transform your clothes in something new. 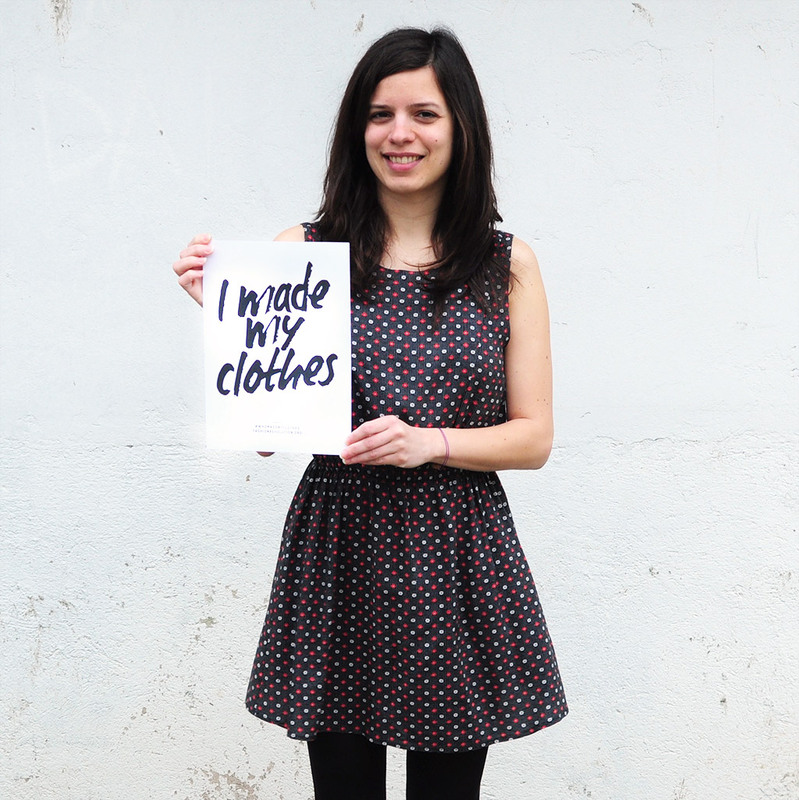 And of course… you can start sewing your own clothes and saying “I made my clothes”! Online you can find a lot of tutorials and a community of amazing people, bloggers and sewing lovers that post their creations, supporting each other and striking up a friendship. The dress I’m wearing in the cover picture is memade with an old vintage fabric (here more info about this dress) and I have worn it a lot more than 30 times over the last two years! I really love it and I wear it in winter, spring and autumn, with different shoes and cardigans/jackets. It makes me feel at ease and it’s perfect in every occasions. It’s one of my favourite dress and I’m very proud of having sewed it on my own! All the images with quotes are from Fashion Revolution’s website. Thank you for this post Martina I followed all your links – copied some to my fb page to encourage others. I agree 100% with all of it 🙂 I’ve been an eco-feminist for more than 40 years and a returned sewer for the past 2 and I’m thrilled that this is a new way for me to contribute to future generations. I can’t say my sewing has completely stopped me from buying clothes but it’s certainly slowed me down and made me far more cognizant of how the clothing industry in general is contributing to an alarming degree – pollution, exploitation and slavery.